From the Baldwin County Courthouse, go west on Hancock St., which becomes Highway 49, and follow Highway 49 south for approximately 10 miles from the Courthouse. Turn left from Hwy 49 onto County Line Church Road. Go approximately 1/2 mile (until you get to the double tower power lines on the left side of the road). Face the power line right-of-way when standing at the point where County Line Church Road and the left side of the power line right-of-way meet. The cemetery is 0.1 mile north (which is diagonal across the field to your left). The cemetery cannot be seen from the highway. 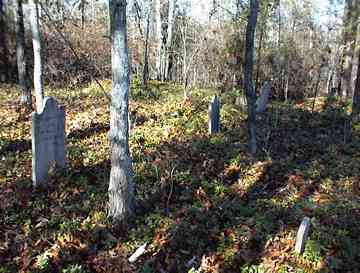 The cemetery is currently in a woods behind a field. Another option is to walk up the left side of the power line right-of-way for 500 feet (to a slight path) and turn left. Then go 200 feet through the woods to the cemetery. 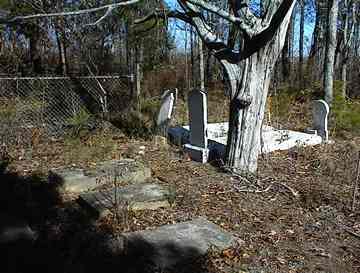 The cemetery should be about 20 feet on your right as you walk through the woods. 55th Ga. in 1864, per RCSG.